Zombie crawl to a 'Thriller' tribute uptown. BOBS & BATHTUB GIN: At the height of Prohibition, there were 32,000 speakeasies in New York City. Tonight, all you need is one: The Museum of the City of New York converts its Fifth Avenue terrace into a speakeasy under the stars, complete with live roaring ’20s music and classic cocktails – plus, you get to rove the museum after hours. 6-9PM, every Wednesday through August. ONE GLOVE: Most iconic music video of all time? Easy: Michael Jackson’s ‘Thriller.’ Head to Marcus Garvey Park for “King of Pop, Master of the Music Video: A Tribute to Michael Jackson,” including a special screening of the masterpiece’s making-of documentary, made by Jerry Kramer and John Landis, who made the video itself for half a million dollars -- crazy money for a music video in 1983. 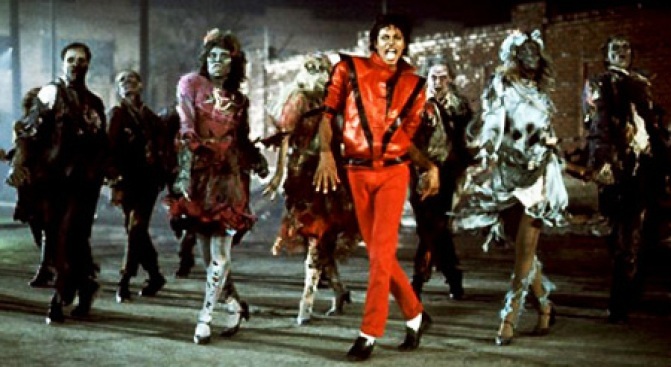 Also: The party promises a mass ‘Thriller’ dance under the stars. (You know you want to.) 8:30PM. CENTENARY: As the NAACP turns 100, the black community reflects. Tonight, Dr. Cornel West –thinker, luminary, sometime rapper – talks with the association’s chairman, Julian Bond, on “The NAACP: Past, Present, and Future” at the Union Square barnes & Noble. Should be one for the books. 5PM.